Note — I am no longer updating this page. When I first started looking at ultra-lightweight travel trailers, there were very few models available in the marketplace. That was during the boom years of the big Class A RVs. Several manufactures tried marketing smaller trailers, and most ended up being discontinued due to lack of sales. 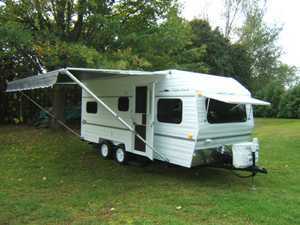 Fast forward to 2008 with the high gas prices and nationwide economic problems, and we find that the small travel trailer is undergoing a renaissance. There are many models available with more hitting the market all the time. While the rest of the RV industry is in a major slump, the ultra-lightweight category is booming. Given their popularity, this information is much more widely available, and given the number of new models, I don't have the time needed to keep track of them all. I will leave this page up for historical purposes. Thanks for visiting, and thanks for all the nice comments over the years. I have been looking for a small camper/travel trailer that I can pull with my existing Ford Ranger pick-up truck with a 3.0 liter engine. I was surprised how few travel trailers are light enough to be pulled by a car or light pickup truck. No wonder so many people are buying the huge SUVs and monster pickup trucks. I also found that most RV companies have little interest in this area of the market. My goal is to have a mobile motel room suite that I can easily pull. Easy to pull is essential given my 150 horsepower engine, and my desire to not be hampered when I travel. My list of wants is a comfortable bed that I do not have to make up every day, storage so I don't have to unpack every day, breakfast making equipment, cold place for my Diet Coke, and bathroom facilities. As it turns out, the bathroom is the trick since it adds all the plumbing and it requires a high ceiling for a shower. I don't want to use campground showers. Finally, a nice to have would be the ability to rip out the useless dinette and put in an easy chair. The other nice to have is A/C power so I can have a flat screen TV and satellite dish. There are four classes of travel trailers that fit this market area. Those are the pop-up tent trailers, fiberglass eggs, teardrop trailers, and ultra-lightweights. I have no interest in pop-ups since I want to use my trailer in both the heat of Arizona and cold of Minnesota. An Egg would work, but I seem to be bothered by the fiberglass smell. A teardrop simply doesn't have the room for the items that I want, but it is a great option for those folks who really like to camp and spend time outdoors. That leaves the ultra-lightweights of 2000 pounds or less, which I review below. Note—I am not a dealer, nor am I affiliated with any of these companies. I am just an RV'er who did some research on this topic, and I would like to share this research with others. The best prices that I quote are not an offer to sell. Rather, they are simply the lowest prices that I have seen advertised for each of these units. Note that changes in exchange rates may cause prices to vary. Outside Length 16'2" 12'2" 14'9" 14'9" 16'0"
Outside Height 8'2" 5'11" 8'1" 8'1" 7'0"
Inside Height 6'1" 6'4" 6'4"
Width 7'2" 6'6" 7'0" 7'0" 7'6"
Outside Length 15'0" 13'4" 13'4" 12'10" 13'10" 15'2"
Inside Length 10'5" 9'4" 10'2"
Outside Height 7'10" 5'8" 6'9" 7'4" 7'4" 8'1"
Inside Height 6'2" 4'1" 4'10" 5'8" 6'0" 6'2"
Width 6'6" 4'10" 4'10" 7'4" 6'4" 6'6"
Outside Length 17'3" 14'9" 15'6" 15'8" 14'6"
Inside Length 10'3" 12'0" 9'10"
Outside Height 6'11" 7'9" 9'3" 6'10"
Inside Height 6'10" 6'6" 5'9" 5'2"
Width 6'11" 6'6" 6'7" 6'8" 6'10"
Outside Length 8'6" 10'6" 12'6" 14'6" 15'6" 17'6" 19'6"
Outside Height 7'11" 8'4" 8'4" 8'4" 8'4" 8'4" 8'4"
Inside Height 6'0" 6'4" 6'4" 6'4" 6'4" 6'4" 6'4"
Width 6'6" 6'6" 6'6" 6'6" 6'6" 6'6" 6'6"
Outside Length 18'0" 11'0" 13'1" 15'0"
Inside Height Movable Roof 6'0"
Width 6'8" 4'10" 6'0" 6'6"
Outside Height 6'3" 8'1" 8'1"
Inside Height 6'4" 6'4" 6'6"
Width 6'6" 7'2" 7'2" 7'6"
Lil Demon: I have not seen a Lil Demon yet. It looks like it would be a great weekend rig for anyone who wants to pull a trailer behind a car. The low profile of a teardrop would really reduce the frontal area drag that kills your gas mileage. At the same time, the expandable roof solves many of the headroom problems of the classic teardrop. It would, however, be little more than an overnight rig (or camp ground queen) due to the lack of facilities and only primitive galley equipment. Note—it appears that the Lil Demon was only made for a short period of time in 2005. Some dealers may still have leftover units, but A-Liner appears to no longer make them. The Twist: I have not seen a Twist in person. The only impression that I have is that they seem relatively expensive for the size and equipment. One dealer has a Twist advertised for nearly $14,000 nicely equipped. That just seems high for such a small unit. Note—it appears that the Twist was stillborn. It was discontinued after only a few months. That is too bad because it looks like a nice sized unit for a weekend fishing trip or other outdoors activity. As of fall of 2007, there were still a few units in dealer inventories. 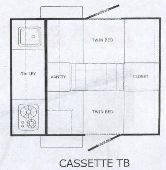 Cassette: The Cassette appears to be a very well built trailer. It is small and looks like it would pull very well. It was the only trailer that I found that would fit in my 7-foot garage. On the downside, it is very short inside. It is missing some of the items I need for a mobile motel suite, such as bathroom facilities, refrigerator, microwave, and A/C electrical system. By the time you add all this stuff on, the price advantage evaporates, so you might as well get a TAB. The one part that keeps catching my eye is the huge back door. This might be useful as a bike or toy hauler if you get rid of the interior wall. Unfortunately, that wall is structural, and the carrying weight is pretty low for a cycle or ATV. Note—the Cassette is now out of production. A few can still be found as of 2006. The A-Liner Twist is about the same size and weight. 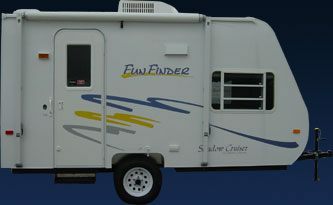 T-139: The Shadow Cruiser Fun Finders are a step up from the other units, more like a conventional travel trailer, but they are still under 2000 pounds. The weight number must be taken with a grain of salt since nearly everyone will order it with many of the accessories that are not included in the dry weight, plus the fiberglass option (which looks very nice) adds a reported 500 pounds all by itself. The T-139 is surprisingly spacious inside, has ample head room, and it really uses the room well. It has great fit and finish, and uses standard RV appliances and fittings. In my opinion, this is a great unit for the weight and money. Note—the Fun Finder model is no longer made. It was replaced by the Fun Finder X, which is essentially the same unit. The X is no longer available with aluminum siding, and the fiberglass adds enough weight to push the dry trailer to over 2000 pounds, but not that far over 2000 pounds. It is still a very nice unit, but on the heavy side of being an ultra-lightweight. T-160: The T-160 is the heaviest unit that I found that was still under 2000 pounds. Everything that I said about the T-139 applies, plus this unit is extremely spacious inside. With the bunk beds, a family of 4 could live in this unit for a week or two at a time. 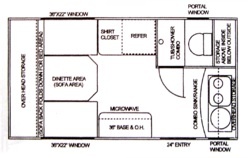 As a mobile motel room, one can leave the bed made up, and still have the dinette available for use. Tab: The Tab also looks very well built. In practice, some users are reporting that the top is delaminating. Thor has been fixing this as it happens. The head room is just a few inches short for me, but the interior room is otherwise OK for me. The kitchen is nice, but one would need to add a microwave, and the lack of a gray water tank will keep you out of some campgrounds. The sink water just runs onto the ground. There are no bathroom facilities, but there is a cabinet to store a port-a-potty. One thing that many Tab owners have been saying is that this is an attention magnet. Folks will gather around everywhere you go. 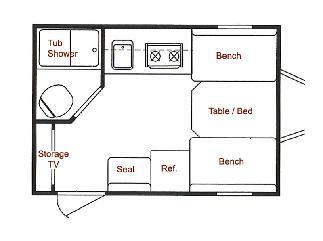 Note—for 2006, Tab has introduced more colors and more floor plans, including a rear kitchen that is configured much like a traditional teardrop. As of 2008, more colors and more floor plans are available, and the assembly bugs have been worked out. In addition, a new bigger Tab is now available, the Tada. Update—sadly, the Tab has been discontinued as of 2010. 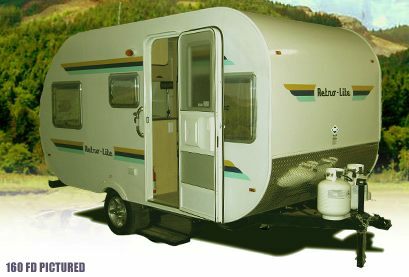 However, Little Guy (makers of teardrop trailers) has purchased the Tab name and will begin producing units in 2011. Utilitoy: The Utilitoy is a new concept from a company based out of the Saint Louis area that has fully endorsed the idea of an ultra-lightweight travel trailer. The unit is built with an innovative composite material that is extremely strong yet light. An optional aerogel insulation allows one to heat and cool the unit despite having thin walls. 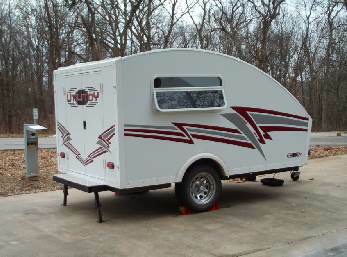 The trailer has a lower roof, so it somewhat like a tear drop. For example, it should be easy to tow. At the same time, it doesn't have the limitations of a tear drop like having no need to go outside to the galley. 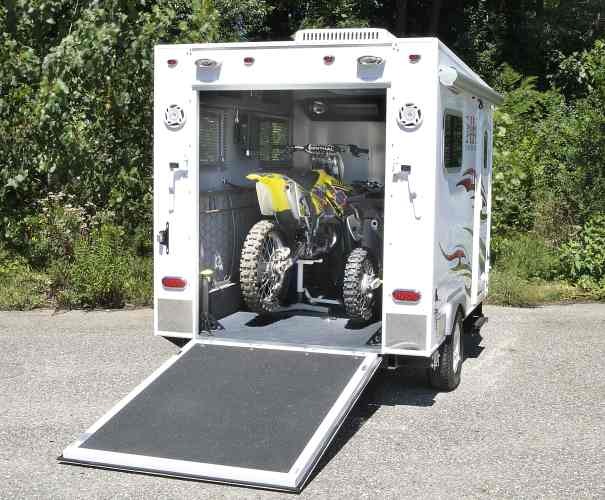 The most remarkable feature of the Utilitoy is the large rear door that makes this unit into a toy hauler that can easily handle the largest motorcycles. This makes the Utilitoy one of the very few options for a small car to tow a camper and haul your cycle at the same time. Basecamp: The Basecamp is built by Airstream. They have a reputation for lasting forever. They also cost like an Airstream. While you can find models at $19,000, units that are nicely equipped rapidly go up to $29,000 retail. 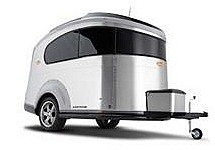 What you get is a sturdy looking trailer that tows relatively easily that looks anywhere from like a retro-style horse trailer to a shuttle craft from Star Trek. If you want something ultra cool, this is it. It is also one of the heaviest of the ultra-lightweight trailers. At 1950 pounds dry, just filling the small water tank puts it over 2000 lbs. The best feature of this rig is that the rear door is built like a cargo aircraft—two clamshell doors open in each direction, then a cargo ramp folds down. That allows you to load up a motorcycle or ATV. So, if you are looking for a toy hauler in the ultra-lightweight class, this is it. But does it ever come with a price tag. 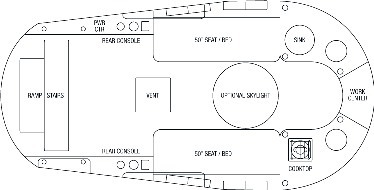 Cabin A: The Cabin A is essentially an A-Frame camper that is permanently in the upright position. This unit uses the interior size very well. The fit and finish is OK, and the materials used in the interior all look pretty good. A residential A/C unit cuts cost and weight. The bathroom is small but usable, and includes a commode with holding tank, plus a shower. My only concerns are that many Aliners have had their floors rot out, sometimes in only 2 years, and the structure seems very lightweight, almost to the point of being flimsy. It is very light for its size, has little carrying capacity, and it is rather expensive. 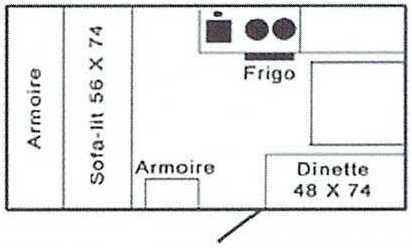 Note—Cabin A was building three different floor plans of the Cabin A in 2007. However, in late 2007, the Cabin A line was dropped from their lineup. Columbia Northwest, the manufacturer, was planning to taking orders for new units until the inventory of parts was exhausted. Note—The Cabin A factory assures me that the floor problem has been solved. It started to show up with 1999 models, and the fix went in at the factory in 2001. New units are not affected, but do check this out if you are looking at a used unit. A'Van Weekender: The Weekender is basically an oversized teardrop style camper. It is extremely light, so it should tow easily. It appears to be well built compared to a typical budget level teardrop. The entire back door opens, giving great access to the interior. In addition, part of the ceiling lifts up to provide an upper level storage space. 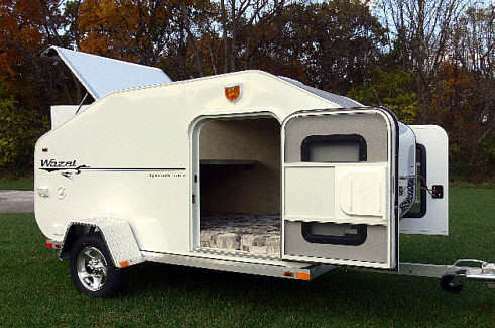 Beyond that, there are not too many of the RV type features as found on larger trailers. The biggest drawback, however, is that this is an Australian product, and they do not have any US dealers. Getting the trailer here would be the trick. It might, however, work for military folks. Hyperlite Superlite: The Hyperlite is new in 2007. 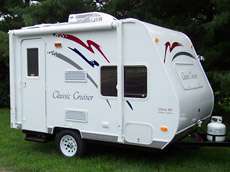 It is a short but tall camping trailer built the conventional manner with fiberglass panel sidewalls and a rubber roof. 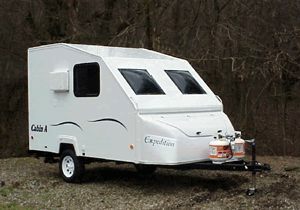 The key difference is that the Hyperlite has folding doors and a ramp at the back to allow it to be used as a toy hauler. It is perfect for cycles and four-wheelers. Everything in the trailer folds against the sidewalls or tucks into the front cabinets. 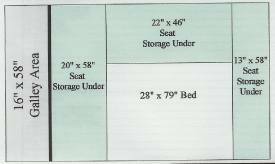 This includes a flat panel TV, refrigerator, stove top, sink, water system, surround sound systems, etc. Such features do not come overly cheap. The trailer sports a base list price at $15,000, and goes near $20,000 nicely equipped. However, some dealers appear to have an overstock, and I have seen loaded units with price tags of $11,000. Hyperlite HLT: The Hyperlite HLT is new for 2009. 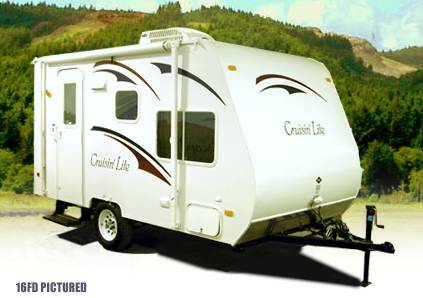 The unit is an updated version of the Superlite with slightly more carrying capacity and improvements to the interior. The front of the trailer has been replaced with a fiberglass cap that has the LP tank carrier molded in. TRE Amelia: The TRE Amelia is built by Columbia Northwest, the folks that make A-Liner and Cabin-A. 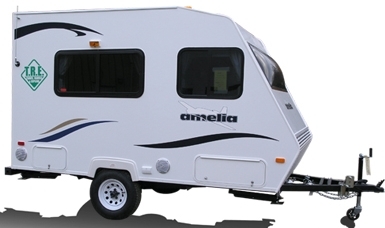 The Amelia is the smallest of three similar looking trailers. These appear to be the replacement for the Cabin-A line of trailers, but much improved all around. Most notably, it has basement storage rather than the front storage box featured on the A-Liners. This also appears to be one of the few ultra-lightweight trailers that have a real bathroom. TRE is attempting to make picking out a trailer easy by shipping all units with a long list of standard options, and leaving very few items as options. I thought that the Cabin-A units were kind of flimsy. Lets hope that the TRE units are a bit more evolved. The price was not yet announced as of January, 2008. 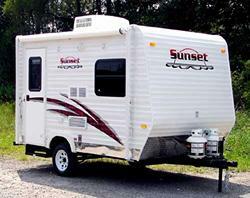 Sunset Cozy Traveler: I have not seen this unit in person. Sunset is a new company started in 2008. Their initial products are 14 foot and 18 foot models. They are fairly conventional trailers that use standard RV materials and components, but use best of the industry methods for assembly. The company looked at many other travel trailers before finalizing the floor plan to gather the best ideas they could find. 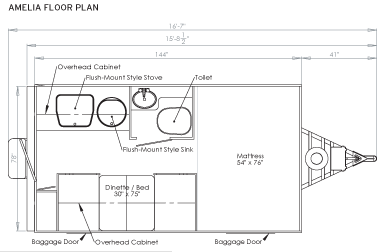 One key feature resulting from this process is the large bathroom, which is uncommon for a small sized trailer. The bathroom is a dry bath that has a separate shower. 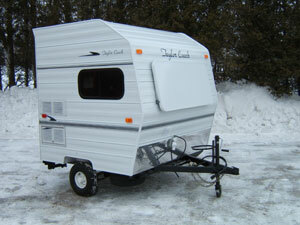 The trailer still has ample storage space, and can have a second bed with the addition of a fold-down bunk bed. 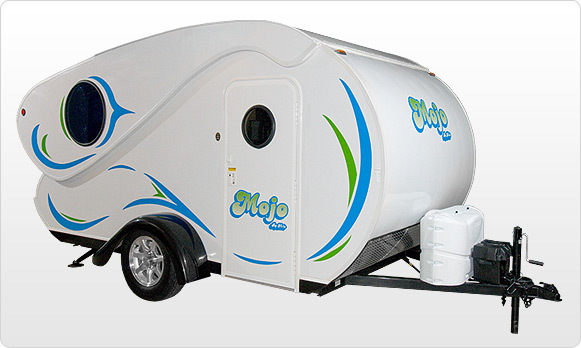 Hi-Lo Mojo: The Hi-Lo company has made convertible camping trailers for decades. The theory is that the trailer folds down for easy and more fuel efficient towing, then raises up to provide more spacious living quarters. 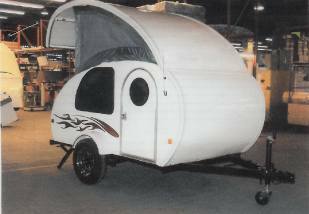 The Mojo applies this technology to a large teardrop style trailer. 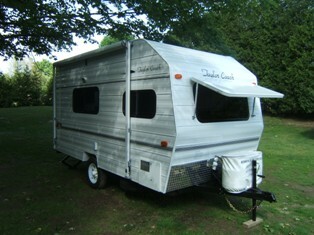 The concept is much like the TAB trailer, but it eliminates the hard to use area at the rear of the unit. In this case, the spring-loaded roof raises up, then the back wall folds into place. The result is an expanded interior space with large windows. Sun Valley Roadrunner 130: I have not seen this unit in person, but owners speak well of both this model and Sun Valley as a company. The 130 is very typical example of travel trailer construction. It gets its light weight by being small. Despite its size, it has big trailer features like RV style appliances, a wet bath with shower, and a dinette that coverts into a bed. A key feature is an abundance of storage cabinets. This trailer has aluminum siding, which looks dated compared to fiberglass gel, but aluminum is much lighter. The last year for the Roadrunner 130 was 2007. Microlite Vymeron: The Vymeron is a more traditional camping trailer with a dinette that converts into a bed, a galley, and a small bathroom. It features all-aluminum construction. The corners are slightly rounded to help the aerodynamics and give some lines to an otherwise boxy looking trailer. It has dual axles to improve the load carrying capacity. This is an all-electric trailer, which means it does not have an LP gas system. The most unique feature is an optional rear loading door with ramp. 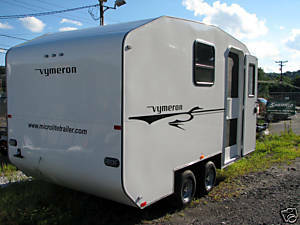 This converts the Vymeron into a toy hauler that is capable of handling a large motorcycle. Microlite Wazat: The Wazat is a variation on of the traditional teardrop trailer. Rather than being shaped like a water bubble or aircraft wing, it has slab sides and flat surfaces. This retains the aerodynamic shape, but makes it easier to manufacture with less wasted material. The Wazat features all-aluminum construction, aluminum exterior, and a diamond plate front splash guard. The trailer looks very sharp on the highway, and it is easy to tow. The unit comes in two pieces. 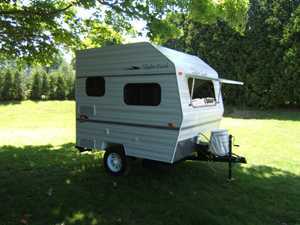 The trailer frame is purchased separately from the camping pod. The pod is available in two sizes, a 4x5 and a 5x5. The 5x5 has higher headroom. 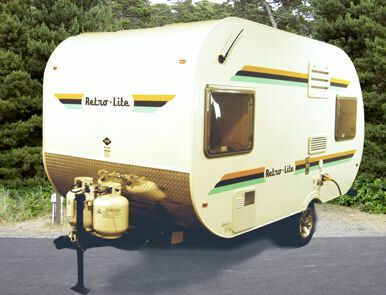 Teardrop trailers usually have the galley at the rear of the trailer under an exterior hatch. The Wazat also has a rear galley, but a fold-down wall allows access from inside the trailer. Safari Condo Alto: The Alto is another Canadian-built travel trailer with a very innovative expandable design. While other expandable trailers use soft-side construction, the Alto has a rigid glass sidewall that is revealed when the roof is raised. This results in a unit that has more than 8 feet of headroom with the roof raised, but with the roof closed, its aerodynamic 7-foot height is easy to tow and it fits in a standard garage. The trailer uses aluminum construction. 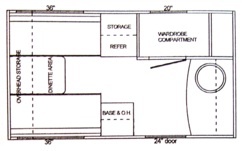 The floor plan is much like other high-end teardrop style campers with a galley on one side, a small bathroom opposite the galley, and a dinette that converts to a bed. 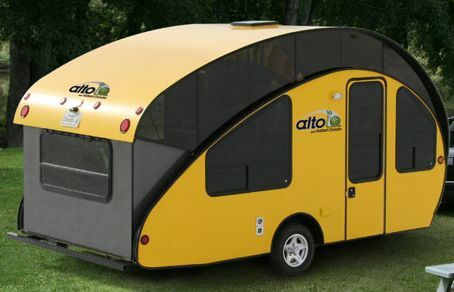 The large amount of window space makes the Alto a unique travel trailer that has the feel of a much larger rig. 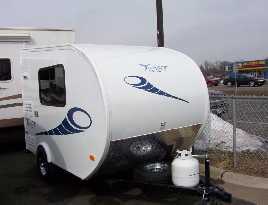 Prolite Eco 12: The Eco 12 is a large teardrop style travel trailer much like the TAB. 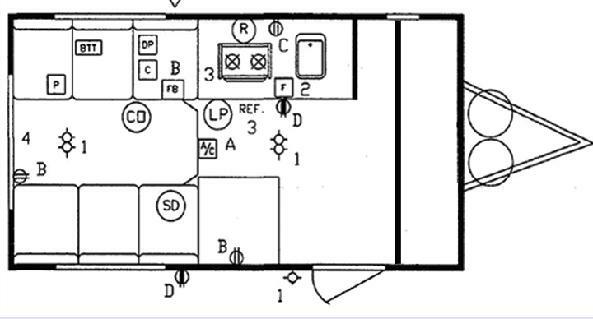 Like the TAB, the galley is located inside the cabin rather than at the rear of the cabin as is common in the traditional teardrop layout. The cabin is built as a single piece using a monocles construction technique. 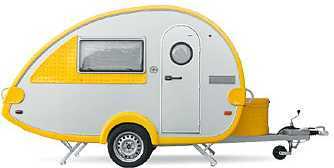 The result is a sturdy camper that is remarkably light for its size. The exterior features several large windows. The interior has a dinette that converts to a queen bed, plus a small galley with a sink and refrigerator. Prolite Mini 13: The Mini 13 is essentially the Eco 12 with a longer mid-section. 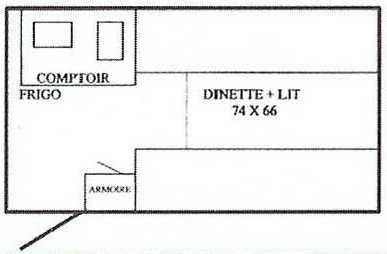 This extra room allows for a sofa in the back and a dinette in the front. The sofa converts into a bed for 2, and the dinette can be converted into a bed for 2. The cabin has a larger galley than the Eco 12 that includes an LP cook top. 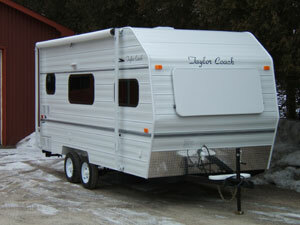 The base weight is very low considering that this trailer can accommodate 4 people. Prolite Profil 14: Like the Mini 13, the Profil 14 is basically a longer version of the Eco 12. The extra 2 feet of space is put to good use by adding a bathroom. The bathroom is a dry bath is a separate shower. 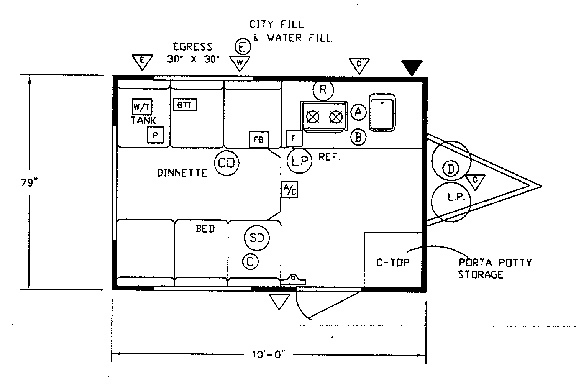 The floor plan has a galley on one side with sink, cook top, storage, and a microwave. 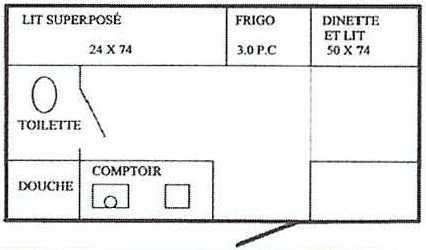 The refrigerator is in a cabinet on the opposite side of the cabin. 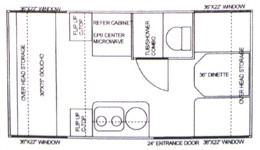 There is a front dinette that converts into a queen bed, and sofa next to the bathroom that converts to a single bed. A bunk bed option adds a spot for a fourth person. American Retro Retro-Lite 140: More info coming soon. American Retro Retro-Lite 160: More info coming soon. Cikira Classic Cruiser 13: More info coming soon. Cikira Cruisin Lite 13: More info coming soon. 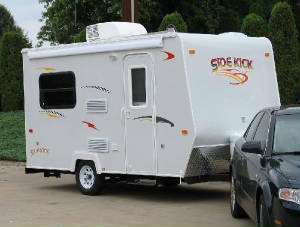 Sidekick RV: I know basically nothing about the Sidekick, and I have not seen one in person. There have been no major magazine reviews of the Sidekick that I am aware of. They appear to be very modern and well built. 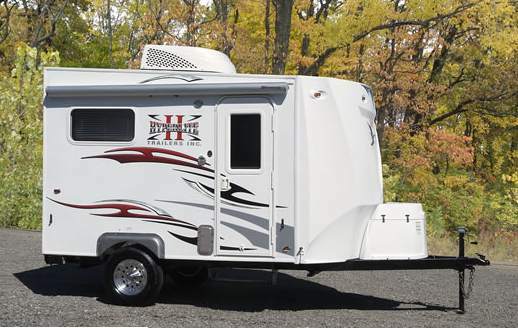 They offer a nice mix of standard features and RV-style options. You will not find granite countertops or designer fabrics, but you will find name brand hardware in these units. The company is new, having started selling trailers in late 2007. They appear to have a dealer network established, they are moving units, and the company is doing well from a financial standpoint. 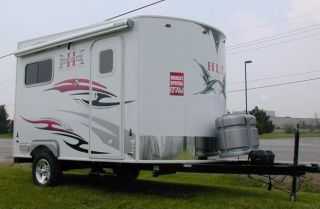 If the quality does pan out, that makes these trailers a very cost effective starting point for the RV'er. My only concern is that the axles look a little light, which really limits the total gross weight that you can carry. Since options are not in the base dry weight, you could easily go over the axle weights just adding options and putting a few cans of beans in the pantry. 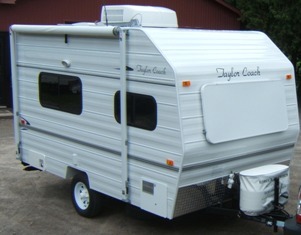 Taylor Coach: The line-up of Taylor Coach camping trailers are all a variation of the same theme. Each trailer is essentially just a longer version of the Lil El 8. 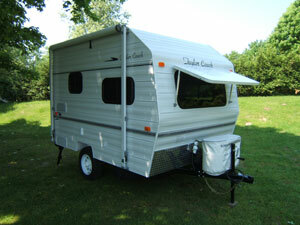 The product line is built using standard RV construction methods and feature an aluminum siding exterior. While the aluminum looks like an older style, it is very light. The smaller units have rear entry doors, the larger units have an option for a side door. As the cabins increase in size, the galley gets larger, and there is more seating space. 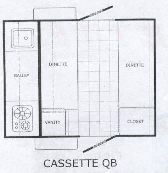 The cabins have ample storage space, with a closet in the smaller units that house a porta potty. The biggest advantage of the Taylor line-up is that they have a lot of headroom despite being small and lightweight. 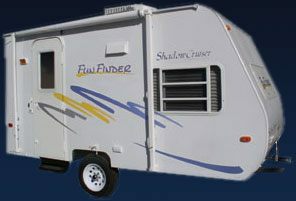 There was a major shake-out in the small travel trailer market in the early 2000s as the Class A RV was the hot ticket. Several makes and models were abandoned and remaining inventories were liquidated. I happened to pick up a Cassette trailer from a dealer in Florida that was hit by a hurricane. While most of the dealership was wiped out, two of these Cassette units escaped without damage. I paid $4,000, about 1/3 of its retail price. My goal for a small travel trailer was a mobile motel room that would allow me to travel without having to preplan hotel stays. This did not work out for me for a number of reasons. First, I found that my V-6 Ford Ranger was not happy pulling this trailer. The weight was not the factor. Drag was the issue. My gas mileage dropped from a highway normal of 22 MPG down to between 11 MPG and 13 MPG. Second, I found that I was not able to use cruise control. The Ranger would bog down on hills, then drop 2 gears and over-rev. I also noticed the transmission getting warm. I decided that I really didn't want to ruin a nice truck this way. There were other aspects of the mobile motel room that didn't work well. The number of free camping spots started to dwindle. Many cities have banned on-street and Wal-Mart overnight stays. I found that I was always too hot or too cold, so not having an A/C unit, heater, and associated generator was not working out for me. Pulling a trailer also made it hard for me to explore. I couldn't go down forestry roads or anything that was remotely off-highway. Making U-turns on dead-end roads was also difficult. I always had to worry about the trailer behind me. This is not saying that a small trailer is impractical. Rather, it simply didn't work for what I wanted to use it for. It would have been perfect for someone who does a lot of shorter weekend trips, especially someone who goes for weekend hunting and fishing trips. I ended up selling my Cassette after about 18 months. A couple who were recently retired school teachers purchased it to pull behind a V-8 SUV. That is a much better vehicle for pulling a trailer. They were setting out on a year long trip to see the USA, camping along the way. I suspect that this was a perfect rig for their intended purpose. My advice? Get the biggest tow vehicle you can. Start with a small used trailer where you invest very little. Learn about the RV lifestyle on something cheap. 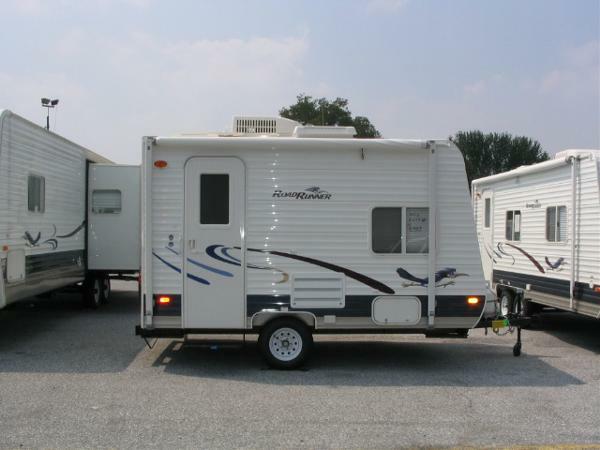 Once you really know what you want, then buy the trailer that you think will work the best. This helps you to avoid making what might be an expensive mistake the first time around. My latest idea? 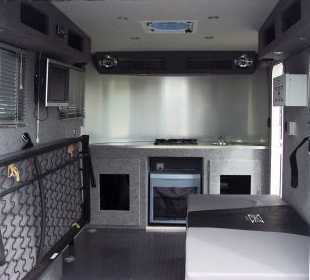 I am looking at a Sportsmobile van conversion. I think that a minimal van conversion would better meet my goal of the mobile motel room that would not hinder my roadtrip style traveling. R-Vision Note—Cassette was dropped after 2004.